For Easter serve your friends Devilled Tomatoes. Yes as your vegetarian friends cannot eat Devilled Eggs … Devilled Tomatoes is a great appetizer or side dish. 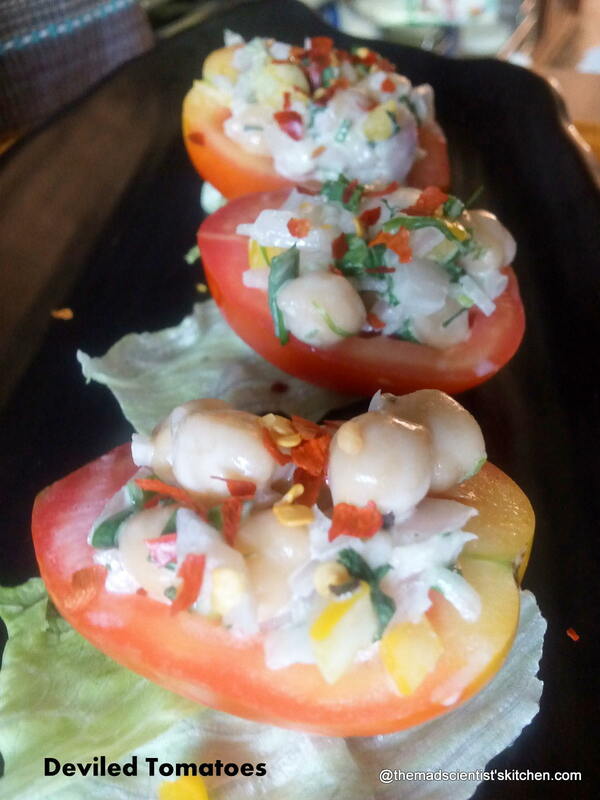 Choose smaller tomatoes (mine were too big) and stuff them with a yummy salad of chickpeas, mayonnaise, and coloured capsicum as the main ingredients. You can also use grated carrots and cabbage. The term “deviled” according to oxford dictionary means cooked with hot seasoning. Deviled the word was first used with food in the 18th century. It was only later in the 19th century it was used to describe spicy or zesty food. The main ingredients used are mustard and pepper. A Victorian British breakfast dish is devilled kidney with kedgeree or kippers. (If you have read Barbra Cartland then you will remember reading kedgeree or kippers). Devilled kidney is made from lamb’s kidneys cooked in a spiced sauce, referred to as “devilling”. The devilling mixture is a concoction of Worcestershire sauce, mustard, butter, cayenne pepper, salt, and black pepper, the optional ingredient is curry powder. Some chicken sauce is also used in the sauce. But now it’s a supper-time dish. Deviled eggs or Devilled eggs are the terms used in US and UK respectively. The other names for the deviled eggs are stuffed eggs, angel eggs, eggs mimosa, Russian eggs, dressed eggs, or picnic eggs. Hard-boiled eggs after shelling are cut in halves. The yolk is mixed with other ingredients the main ingredients being mayonnaise and mustard. But then the list of devilled foods seems to be vast you have deviled ham, deviled crabs, deviled cabbage, deviled Brussel Sprouts, deviled food cake. Check it out here. Whatever deviled foods you serve, serve it cold. Serve as a side dish, appetiser or a main course, for holidays or parties. Serve a vegetarian option of deviled eggs to your friends this Easter. Cut the tomatoes into half and scoop out the pulp. Discard the pulp. Mix the chickpeas, capsicum, onions (if using), curry powder, mustard, mayonnaise, salt and pepper. Scoop the chickpeas mixture in the tomatoes. Garnish with red chilli flakes and serve. Go easy on the mustard. You can always add more if you need. I have used spring onions onions only as I wanted to finish them. You can opt out of them. I’ve never heard of deviled tomatoes before, but now that you’ve mentioned it, I can’t wait to try it out. Very interesting one Archana…I always wanted something instead of the eggs, you have it now..good one..
Thats a fabulous dish, deviled tomatoes looks super good. 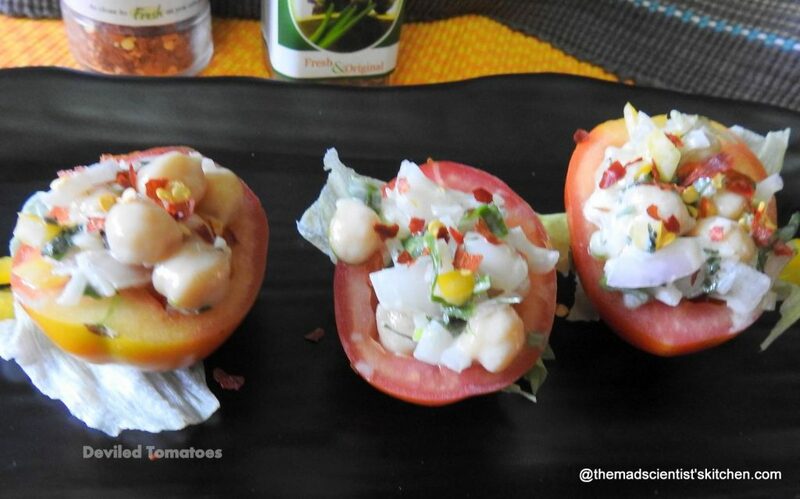 Very interesting one Archana,deviled tomatoes look yummy .. Very interesting way to serve tomatoes! 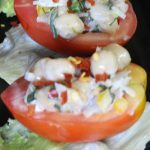 Deviled tomatoes is a nice option and a substitute for deviled eggs. The filling sounds yummy!! Wow, that’s such an innovative dish. Deviled tomatoes look amazing. That’s such a creative and cute dish!